Scant elements of the gnostic worldview remain in the Jewish scriptures. They are hidden, to be ferreted out from among the obloquy heaped upon gnosticism by the later scribes. The meaning of old gnostic symbols was lost, perhaps unknown even to many in later antiquity. 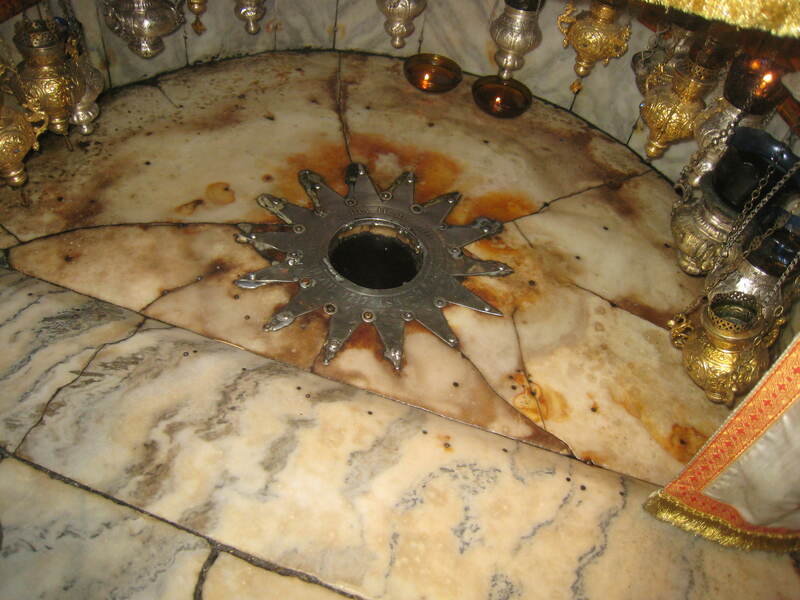 When the Jewish religion turned against its gnostic roots, the Aaronide priests of Jerusalem jettisoned the old goal of ‘acquisition of gnosis’ (which was still practiced at Dan in the north) and fashioned an impassable chasm between man and god, one not to be crossed. Thus Judaism made an about-face, from a people who at first celebrated ʻcrossing overʼ from the material to the transcendent, to a people who forbade even the presumption of this possibility. The strict separation between man and God is an essential requirement in Judaism. This is also why the religion is inveterately anti-gnostic. In gnosticism, after all, man becomes divine. In Judaism, this concept is the epitome of horror. In Jewish scripture, Yahweh is repeatedly victorious over those who try to see, reach, or be like “god” (cf. The Tower of Babel; Adam seeking the fruit of knowledge, etc). Yahweh is also victorious over the land-serpent (a symbol of wisdom as early as paleolithic times) called Behemoth, and especially over the water-serpent—the ʻmonsterʼ Leviathan. 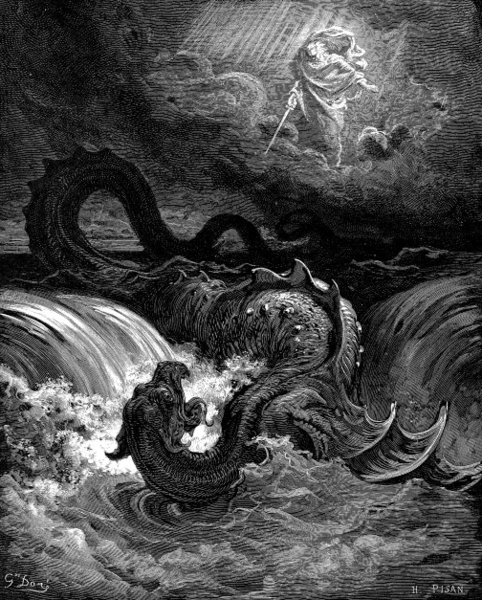 It has been suggested that the name Leviathan is related to Levi. This would reflect the ill fortune that befell the Levites with the ascendency of the Aaronides in post-exilic times (see below). How often the gnostic light bringer (Lucifer) of one age is the devil of the next! In brief, even though the earliest Hebrew self-definition was gnostic, the religion soon and determinedly betrayed those roots. It exchanged understanding ʻthat which isʼ for obedience to ʻThat Which Isʼ (Yahweh). Worship of god thus replaced understanding of life. I suggest that this predictably occurs when a religion reaches a certain level of organization, at which stage a powerful priesthood inevitably finds obedience necessary—and independent searching threatening. Jewish scripture repudiates in no uncertain terms gnostic elements such as ʻbecoming like godʼ (“all-knowing,” “enlightened”). In this connection, it is instructive to compare the various flood stories. In the older version, Ea/Enki confers divinity upon Utnapishtim, the Mesopotamian Noah, with the following words: “Formerly Utnapishtim was a human being, but now he and his wife have become gods like us. Let Utnapishtim reside far away, at the mouth of the rivers” (Gilg. XI:192 f).40 The place where Utnapishtim resides is Mt. 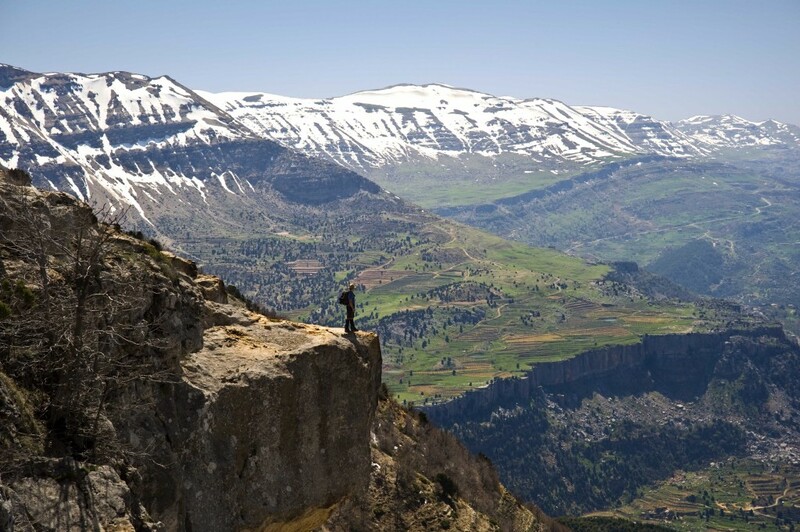 Hermon in the Lebanon, to which Gilgamesh travels, and the rivers which issue from that mountain are the Jordan to the south and the Adonis (Nahr Ibrahim) to the west. None of this is found in the Jewish version, where Yahweh merely blesses Noah, whose progeny then populate the earth (Gen 9:1). The second chapter of Genesis also manifests a strident Jewish rejection of gnosticism. “The tree of the knowledge of good and evil you shall not eat,” Yahweh thunders to Adam. “For in the day that you eat of it you shall die” (Gen 2:16–17). Adam eats of the fruit. However, he does not die but in fact gains precious knowledge. Adam (Heb. “man”) does not succumb to intimidation but essentially gives the lie to Yahweh. “See,” Yahweh remonstrates, “the man has become like one of us,41 knowing good and evil; and now he might reach out his hand and take also from the tree of life, and eat, and live forever” (Gen 3:22). This is jealousy of manʼs potential, pure and simple. It shows Yahweh essentially as manʼs opponent, henceforth doing what he can to limit manʼs possibilities and to prevent his ʻreaching out to eat from the tree of life.ʼ Via the pens of Jewish scribes, Yahweh ejects man from the Garden of Eden and posts cherubim to guard “the tree of life” (3:24). Henceforth a chasm exists between man and god. The basic message of Yahweh is “Do not approach!”—in diametric contrast to the gnostic message. In addition, Yahweh lays a number of frightful punishments upon man for his insufferable disobedience (3:16–19). These few verses establish the basic foundation of the Jewish faith and reveal it to be a religion of intimidation and limited possibilities. A curious story in Judges 17–18 links Bethlehem and Dan, the settlement far to the north. The story is constructed in such a way that its intention is inescapable: Bethlehem of Judah was the origin of the ʻwaywardʼ priesthood of Dan. producing the sacred waters of several rivers. Dan (known as Laish in pre-Israelite times) was a fabled religious center with its own priesthood. This sanctuary lay at the headwaters of the river Jordan and at the foot of Mt. Hermon. The area had for many centuries (even millennia) been known far and wide as an international cultic center, to the extent that even the ancient Gilgamesh journeyed from Mesopotamia to the “cedar mountain” of Lebanon in search of wisdom. There, he found Utnapishtim, the hero of the flood story, now living his immortal existence far from ordinary man. In Jewish scripture we encounter much polemic against the northern sanctuary. Anti-Danite material is found in all three branches of the Tanakh: the Torah, Prophets, and Writings. The story in Judges 17-18 is but one example. It contrives to explain how Dan, dedicated to idol worship, came to be a part of Israel and, furthermore, why it was perpetually under a curse. The story imputes the origins of Danite religion to a Levite from Bethlehem. Without entering into an extended discussion here, we note that this is also an example of hostility directed by the Aaronide priests of Jerusalem (who redacted the Torah) against the “Levites,” the landless clan of Israelite priests scattered throughout Palestine. The story under consideration is briefly as follows. Micah, a man “from the hill country of Ephraim” keeps an idol in his house. If this weren’t reprehensible enough in priestly Jewish eyes, we learn that the silver out of which the idol was made had been stolen by Micah from his own mother and, additionally, that the silver was under a curse (17:1-4). “To live wherever he could find a place,” a Levite “of Bethlehem in Judah” arrives at Micah’s house in the “hill country of Ephraim.” Micah offers to hire him to be his priest. The salary is “ten pieces of silver a year,” and we can readily infer that this payment is from the silver which had been cursed and stolen. Judges 18 introduces the Danites who are still wandering in the south and looking for a permanent home. The parallel with the Levite of Bethlehem who is also looking for a home cannot be coincidental. At 18:3 the Danites arrive at Micah’s house, and “they recognized the voice of the young Levite.” This reveals a pre-existing relationship between the Danites and the Levite, one formed when the latter had lived in his hometown of Bethlehem. This further links the Danites with this particular Levite, and both with Bethlehem of Judah. 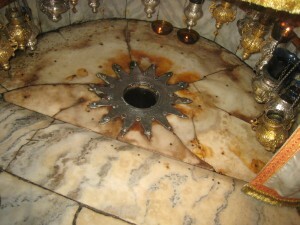 once a shrine to Adonis and then birthplace of Jesus. At 18:6 the Levite, now acting as priest of Micah, is a mouthpiece of Yahweh. He encourages the Danites in their mission to find a home and it is immediately thereafter that the Danites descend upon Laish/Dan. In this way, the author has shaped his story so that the Levite from Bethlehem plays a critical role in the establishment of the northern settlement of Dan by the Israelites. The entire story in Judges 17-18 can be seen as a self-legitimation exercise written by the Aaronides in Jerusalem against the age-old priesthood resident at the sanctuary of Dan. Our interest focuses particularly on an aspect of the Micah story that has received scant scholarly attention: the connection between Bethlehem, the “hill country of Ephraim,” and Dan. These three geographical entities are linked in their adversarial position vis-a-vis the Aaronides: (1) Dan is the location of the delegitimized northern cult; (2) Ephraim is territory encompassed by Samaria—a region long delegitimized in the eyes of Jerusalem; and (3) Bethlehem, according to the story under discussion, is the hometown of the Levite who inspired the idolatrous cult that eventually located at Dan, and which did so via Samaria. (Tammuz/Dumu-zi, “True Son”), son of the water god Enki, at Afqa near Mt. Hermon. When the Christians arrived here in the fourth century, they destroyed the temple so that no two stones were left standing on top of one another. There is not space here to explore the importance of Dan/Galilee as a famous gnostic cult center already in the third millennium BCE. Issuing from the mountain above Dan, the Jordan was especially sacred, its water a pre-eminent symbol of gnosis. 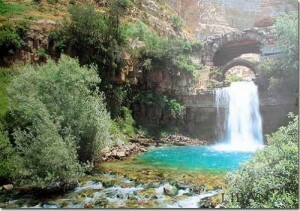 The Jordan was the gnostic river par excellence. Dipping into it (“baptism”) was symbolically the equivalent of enlightenment. 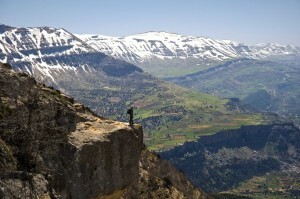 The great mountain was itself the original Zion (Tsion), known also as Hermon and Senir. In the Bronze and Iron Ages, “the entrance to the cave of night” was thought to be located there, for over that mountain the sun descended into the western sea for its nightly journey under the earth. Here, in other words, were the gates to the underworld. This was where the Laḥmu deities had their home. Here, metaphorically speaking, was the first “Bethlehem” (“House” of the god “Lahmu,” not “House of Bread”). If the Levites were indeed linked in some way to gnosticism, this would in great measure clarify the hostility directed at them in the Torah, and why the Levites are demeaned and subordinated to the Aaronides in no uncertain terms. Commenting on Num 18:2-7, E. Rivkin writes: “The Levites are to function as Aaronʼs servants and under penalty of death are prohibited from burning sacrifices at the altar.”44 By Aaronides is meant the aloof, self-serving, and ritualistic post-exilic priesthood centered in the Jerusalem Temple. temple of Ea, my lord” (Atr. 22.421,7). 41. The plural “us” shows that Yahweh was still but one among many divinities. 42. Galilee extended east of the Jordan, as we see from the description of Josephus (Wars 3.3.1).